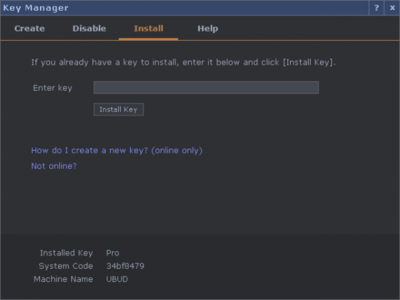 1.1 How do I create and install a key? 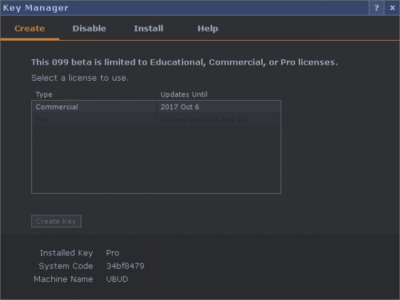 1.2 Can I use a license on multiple computers? 1.3 How do I move a key to another computer? 1.4 How do I check all the licenses on my account? 1.5 What are the differences between license types? 1.6 How do I purchase licenses? Non-Commercial licenses are for personal, educational or evaluation purposes for non-paying/non-commercial use only . You may not use TouchDesigner Non-Commercial for any paid work with TouchDesigner. If you or your organization are compensated for your work with TouchDesigner, you must have a Commercial or Pro license. Licenses are available for purchase at the Derivative Store. How do I create and install a key? A single license can only be used on one computer at a time. However you can move that license between machines an unlimited number of times. To do this you'll need to disable the key on the active computer, then generate a new one for the new computer. How do I move a key to another computer? To transfer your key to another computer, you must first disable the key from where it is currently installed. 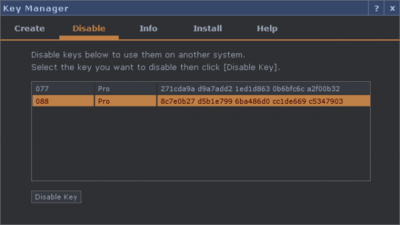 Once the key is disabled, it can be used to create a new key for any other computer. After disabling, use the instructions above to Create a Key. How do I check all the licenses on my account? A complete list of the licenses on your account can be viewed in your member profile. To access your member profile, go to www.derivative.ca/Login and login. Once logged in you will see three tabs, go to the Keys tab to view all your licenses and keys. What are the differences between license types? See the section above License Features. 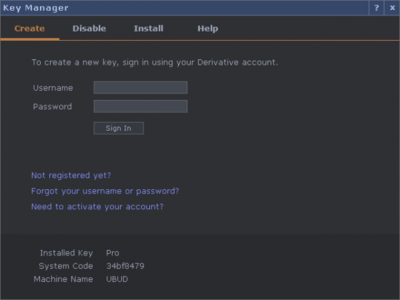 Licenses and upgrades can be purchased from the Derivative Store.